Rising senior Jo-Jo Biddle and alumnus Tristan Ruh '15 selected as 2015 US Lacrosse High School All-Americans. Pacific Ridge School junior Jo-Jo Biddle and alumnus Tristan Ruh ‘15 were recently selected as 2015 US Lacrosse High School All-Americans. The award is the highest honor given to high-school lacrosse athletes. Biddle and Ruh were among just ten players from San Diego to earn All-American recognition this year. Biddle and Ruh's All-American selections come on the heels of a remarkable season for Pacific Ridge Boys Varsity Lacrosse. 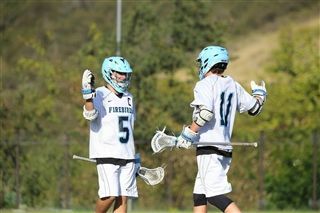 The Firebirds finished the regular season undefeated in league play, ranked No. 2 in San Diego County, and among the top 10 teams in all of Southern California . Ruh will continue his lacrosse career at Boston University this fall. Ruh has committed to the University of Pennsylvania.